When my Dad was turning 50 (a decade or so ago) my step-mum – AKA Wicky Steppie – wanted to throw him the most amazing party ever. They lived on Waiheke Island, off Auckland, and the plan was a big day of canyoning, followed by a raucous knees-up at dinky yacht club that we’d hired exclusively. The plan was, well, debauchery. Lots of it. Wicky Steppie wanted an old school, spaghetti-slinging, cream-pie throwing food-fight, and dancing til dawn, but most importantly, she wanted a vodka luge. I’d worked at some amazing functions with vodka luges that defied the imagination. One in particular you poured vodka into the neck of an ice sculpted torso, and the vodka swirled through in the internals before being slurped by the slurpee at the money end. Front side. One for the boys. One for the girls. As we were no ice sculptors, we decided on a large bucket of water that we were going to freeze and my genius idea was to take a length of garden hose, feed a piece of wire through it, bend it into a spiral, freeze it into the water and create an amazing luge through which we could drink frosty vodka until we all had slurry- drunken ice-cream headaches. The plan was to simply pull the hose out leaving my awe-inspiring spiral. Sadly, once frozen, the hose was not going anywhere and no-one, but no-one, could pull that Excalibur from it’s icy rock. We ended up unceremoniously gauging a channel in the top and creating a piddly vodka rivulet. Although the effect as somewhat similar, we decided we had grossly over-engineered the project. A number of times in the making of these delicious icy poles, I wondered if I was doing the same thing? Initially, I wanted twice the layers, all of them to be perfectly divided like the amazing ones you see on Pinterest. Alas, who has the time or patience?? Not I, it would appear. That said, these are by no means difficult. They’re a piece of cake, and totally worth the effort. If you have neither time nor patience, just fill each one with one of the different flavours and be done with it, but if you can be bovvered, you’ll be as popular as I am around the homestead. These were absolute winners. The long pops were made in test tube shot glasses I found in the party favour aisle of my local supermarket and the sticks were wooden chopsticks. I stood them in a deep plastic container filled with my baking beans (the beans I always use for blind baking my pie crusts, but you could use rice or whatever) to make them stand up. You can also use plastic cups with plastic spoons for handles or the old fashioned icy pole making kits. Blitz your watermelon flesh until smooth then add your lemonade. If you prefer them totally sugar free, omit the lemonade, but I love a little tingle of effervescence in my top layer. Half a cup between all the pops is nothing to stress about in my humble sugar loving opinion… not that I’m an expert. 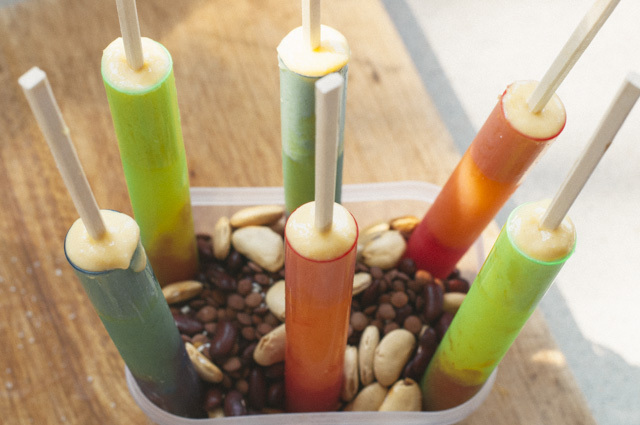 Divide between your icy pole holders, and pop into the freezer for about 30-45 minutes until the top has hardened. Blitz your pineapple (you could add some coconut cream if you wanted. I nearly did but decided against it last minute – you could totally do Pina Colada adult ones too…..YUM!! ), and add that as your next layer when the time is right. Freeze again for 30-45 minutes. 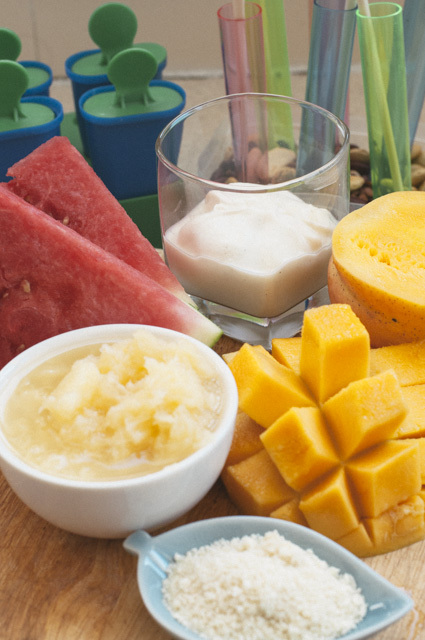 Blitz your mango with the yoghurt and add the almond meal to give it a little more body. 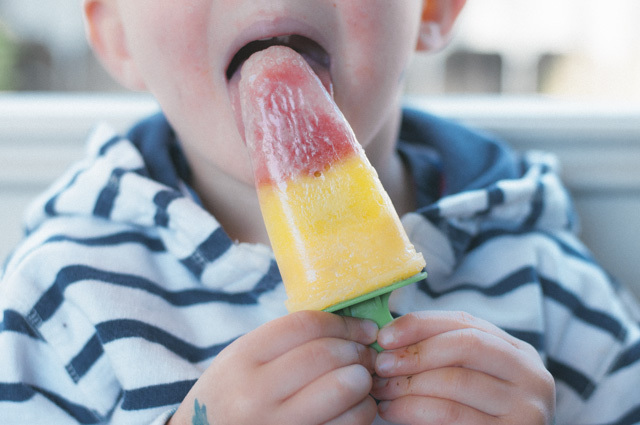 Add that to your pops, and slide your sticks or spoons in, or place the icy pole lid on before sticking into the freezer for a good few hours. Not indicative of how tasty the pops are. Kicking it on Tuesday with the IBOT gang over with the essentially gorgeous EssentiallyJess. These look great, if only I had more room inmy freezer!! YUM! I don’t drink vodka, but I’d give these icy poles a shot. My daughters would love them too this summer. Mmm yum! I can’t wait to make these as soon as the weather warms up again! That vodka contraption sounded like it had the potential to be epic! Those iceblocks look delicious and are probably better for my waist line than the ones out of the freezer section! Also, I had never heard of a vodka luge ever which upsets me slightly! It would be even better I’m thinking with all the flavoured vodka’s available these days. Oh god, these days my liver gets a’quiver just thinking about it!! Oh, the beautiful colours! I was eyeing your fruity icy pops making on FB and was thinking how delicious they must be! Your little one picking her nose? Priceless! Yum! 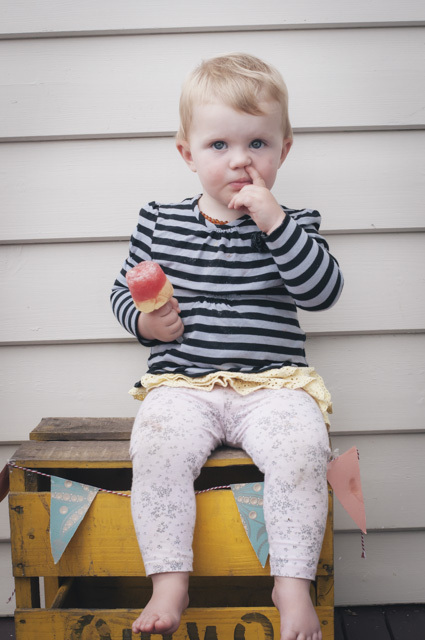 Punky has recently discovered how good ice blocks are after I shared one of of my smooze ices with her so I am thinking I definitely need to make some of it own so it doesn’t cost me a fortune this summer! Might have to steal is recipe but include a strawberry (her fave) layer as well. How good are smoozes?? So cheap and easy to make your own. Picnics for the uninitiated…. or even those in the know.